Renuvo is a patent pending adaptogenic formula that targets healthy aging by supporting a more youthful response to daily life stressors that may push your body out of balance. 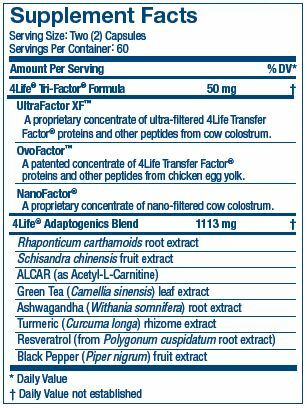 At the core of Renuvo is 4Life’s proprietary immune system support ingredient— 4Life Transfer Factor. Contains adaptogenic ingredients like rhaponticum, schisandra, and ashwagandha, plus Acetyl-LCarnitine, green tea extract, turmeric extract, resveratrol, and black pepper. Contains Transfer factors that provide knowledge to your body’s immune system, supporting its natural ability to respond appropriately when challenged with health threats. Reduces inflammatory response to an unhealthy, inflammatory diet (high sugar, high fat), improves the body’s antioxidant capacity, and shifts to the use of fats for fuel. Consuming 2 servings per day of 4Life Transfer Factor Renuvo for 30 days resulted in a significant reduction in the inflammation marker TNF-alpha. Increases the body’s principle enzyme responsible for helping to fight free radicals and increase antioxidant capacity. The purpose of Renuvo is to help speed the natural recovery of your body’s internal see-saw into a level, healthy state. It increases adaptability to stress by addressing five body functions that can either support or disrupt your immune system and are critical areas of focus in the aging process: brain and mood, muscle and energy, sexual health and vitality, adrenal function and recovery, and mitochondria and metabolism.